I suppose it is in my blood. By nature, or from learned behavior (thanks Dad), I am completionist. Although not technically a word that you will find in a dictionary, I believe we all know what it means and most of us can relate. My hobby of choice, is trading cards. More specifically, baseball cards. More, more specifically, A’s baseball cards. More, more, more specifically EVERY A’s baseball card! Once again, thanks Dad. I want them all. No, I need them all. No, I want to need them all, or is it I need to want them all? I was sorting through old 1980s cards in my collection the other night and thought to myself… Had I not collected as a kid, there is no way I would be pursuing my A’s PC the way I am. Without the assist from my childhood collection giving me a massive head-start, I don’t believe I’d have the patience (or money) to go back and collect every A’s card produced (sans parallels and one of one’s of course). So for this, I suppose I should once again, say thanks to my dad! I have built an extensive checklist for my A’s cards. My database is thorough and detailed. However, it’s also very daunting. To look at it can be overwhelming, both for what I don’t have, but for what I do have as well. I have a lot already, but I have a lot of needs left. It will be a life-long project, one that I hope I can share with my boys… And one I hope that they will take over someday, when my time has come. In the meantime, I have to vent. Being a completionist is a tough thing. I am sure most everyone can relate to some degree. If it’s cardboard… If it’s green & gold… I want it… Nay… I NEED it! I don’t just want the ones I like… I want them ALL! I want the COMPLETE set! Yesterday was a day of reflection for me when I had a I-miss-“my”-childhood moment at my Local Card Shop (LCS). I’ve took to Twitter in the past to vent my frustrations with the current state of this collecting hobby. Something that should be fun, seems more like a headache more often than not. Collectors have so many different products to purchase nowadays, you simply cannot collect everything. Especially not at the retail prices that our LCS’s have to charge to make a profit. But I digress, this is not about the cost of the hobby as much as it about the sheer volume and speed in which it comes at us. Before you have a chance to catch your breath after the release of Topps’ flagship Series One in February, you are slapped in the face with pictures of cards on Twitter from “Next Week’s Release of Topps Tribute”! But don’t get caught up in the excitement of this $50 per pack product, because 2 days later, is the release of Topps Turkey Red, a limited print run product (which features major coalition issues, but that’s for another day). Before Topps could get to it’s next big release (Heritage), Panini drops Donruss into our laps. Then after the “street date” gets pushed back 3-4 times, Heritage finally hits stores… Followed very quickly by Museum Collection (At $50 a pack and $200 per box, no less)… And folks, that covers February and March of 2014! 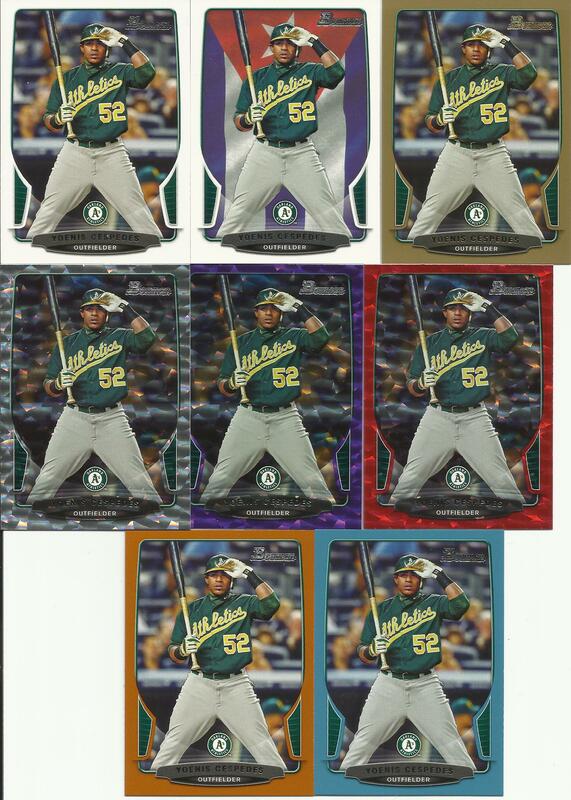 I fancy myself as a 3-type collector… I collect Oakland A’s cards for my personal collection (PC). Any ole’ A’s card will do and it will be much loved. Second, I am a vintage collector, leaning towards my PC A’s first and foremost. And lastly, I am set builder/collector. In recent years I have completely stopped buying packs/boxes of cards. Not at the cost of $75-$500 per box. The reasoning behind this revelation in my collecting habits stems from wanting to focus on my PC needs first. However, with this change though, comes the fact that I won’t ever get the thrill of ripping into “wax” anymore. I won’t ever get the chance at the big “case hit”… Or any other highly sought after cards from the latest release. The beauty of this type of collecting is that I can funnel ALL of my resources into buying specific cards for my PC and I have the peace of mind in knowing that I will only be buying the cards I truly want. If you know me from Twitter (@ourtradingcards), you know that I love me some Yoenis Cespedes… I love me my A’s cards… And you may be asking yourself where exactly am I going with this blog and my “revelation” yesterday at my LCS. Before I get to that… Let me show you one small example of how frustrating it is to be a TEAM PC’er in today’s hobby. Let me recap (and I will assume I didn’t overlook any)… The approximate cost (on the low end) for this A’s whole Heritage collection sits at $965! Or the cost of almost 13… THIRTEEN boxes of Heritage! So please explain to me again why I would buy a box to bust before I pursue my A’s PC??? The last year I bought Heritage by the box, in fact, was 2012. I bought 1 blaster for $20 from Wal Mart and 3 boxes from a LCS at $70 each… So my total investment was $230. The base set featured 425 cards. After compiling my personal set, I was almost 200 cards short of a complete set! No SPs or insert sets! Just the BASE set! And I had more cards in my “dupes” pile than I did in my set pile! So now we are getting to the purpose of this blog. This hobby is and most likely will always be a “Man’s” hobby from this point forward. Gone are the days of the 10 year old kids running into their LCS with their lunch money in hand. Choosing an empty stomach in pursuit of opening up a pack of cards to unearth their favorite players (and a stick of stale gum!). So back to where I began. Yesterday I am sitting at my LCS surrounded by an array of over-priced unopened packs of glossy cardboard pictures of men. There was Topps Museum Collection (NFL and MLB) at $200 per box; Panini National Treasures at $500 per “pack”; Panini Titanium at $100 a box; Panini Totally Certified at $120 a pop; Topps Tribute at $300 a box; And, of course, many more products! The only 2 products that were “affordable” were Topps Stickers and Topps Opening Day… Afterthoughts to 98% of collectors in today’s market. So, two kids walk in… Probably 6 & 9. They go through the LCS’s selection of $0.10 inventory blowout cards. They were so excited to see Cal Ripken and Ken Griffey Jr in there! Jose Canseco, Mark McGwire and Sammy Sosa! One of the boys yells to his mom “This guy used to play for the Philadelphia A’s”! (Referring to an old Fleer product and a Jimmie Foxx card). I knew damn well, watching these boys, that they’d never know the joy of taking $2.00 into a hobby shop and taking away eight packs of cards. (At least not 8 packs that feature current players… I am sure every LCS has tons of old 88-91 packs laying around). “My pack had three Marlins players in it… How sick is that”!! !